Kimberly Robertson (Mvskoke) is an ARTivist, scholar, teacher, and mother who works diligently to employ Native feminist theories, practices, and methodologies in her hustle to fulfill the dreams of her ancestors and to build a world in which her daughters can thrive. She was born in Bakersfield, CA and currently lives on unceded Tongva lands. She earned an MA in American Indian Studies and a PhD in Women’s Studies from the University of California, Los Angeles in 2012. She is an Assistant Professor of Women’s, Gender, and Sexuality Studies at California State University, Los Angeles. "I was a first-generation college student, the oldest of six, and the first in my family to go to college. When I took a women's studies class my freshmen year, I felt like the whole world cracked open for me. I finally found the words to articulate my experiences. The same thing happened again when I took my first Indigenous studies course. I really fell in love with education (and eventually ARTivism) as a tool for social justice, community empowerment, decolonization, and healing." laser print on matte cardstock. Released in 2017. Some people measure their wealth in fast cars or fat wallets. In fancy dinners and fine jewelry. Where I come from, we measure our wealth in aunties. This print is dedicated to the auntie alliance - the posse of knowledge-wielding warriors who love us into our best selves. On Christmas Eve, artists took their a public art intervention, #JailBedDrop to the streets of Los Angeles. 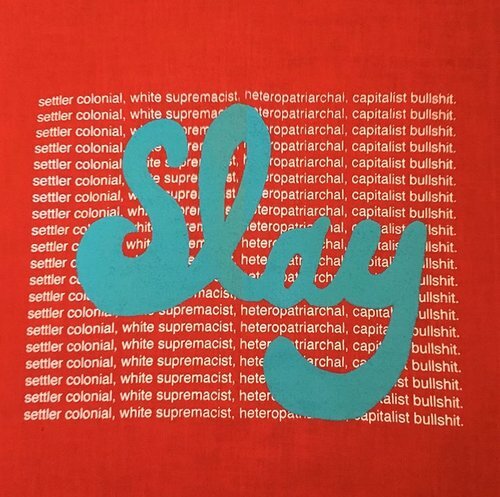 Members of the Green Corn Collective, “A Constellation of Indigenous Feminist Bosses,” created one of the installations in this “artivism” action initiated by JusticeLA. The jail bed at Walt Disney Concert Hall. Photo courtesy of Kimberly Robertson. In roughly three weeks, artists Michelle Bernardino, Gem Labarta (Navajo), Tawny Ruiz (Navajo), Xochitl Villa, Kimberly Robertson (Mvskoke) and Jenell Navarro (Cherokee descent) designed and created the bed. 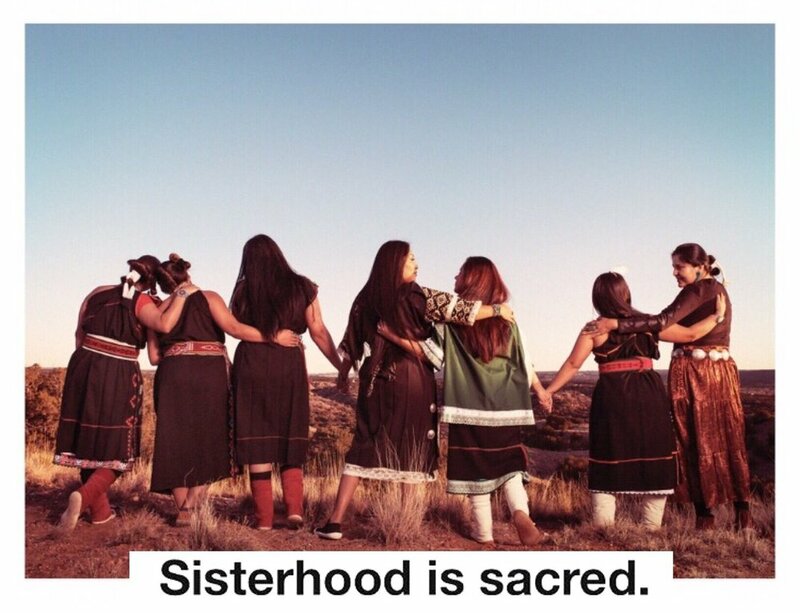 Jennifer Varenchik (Tohono O’odham) documented the process. The top bunk of the jail bed. Photo courtesy of Jenell Navarro. Justice L.A. is a coalition of more than forty activist organizations. In September 2017, JusticeLA placed one hundred steel-frame jail beds outside the Los Angeles County Hall of Administration to protest the expansion of a prison. The Christmas Day action involved placing over fifty decorated jail beds at several locations across Los Angeles. These beds highlighted, among other things, the high rate of incarceration of people with mental illness, people who are homeless, and people of color, especially African-Americans and Native Americans. Organizers said they chose Christmas for the action to remind people how many of their fellow citizens spend the holidays incarcerated. The bottom bunk of the jail bed. Photo courtesy of Jenell Navarro. Like most of the jail beds involved in the action, the indigenous artists’ bed was removed almost immediately, but the memory of it most likely remains in the minds of those who witnessed it. The jail bed prepared for “dropping.” Photo courtesy of Kimberly Robertson. They said the collaborative nature of the bed’s decoration was also powerful. “We met in the designated location, alongside other community artivists working on their respective beds, and spent many hours creating the string of beads for each color of the four directions and then wrapped around the bedposts. At first, it seemed to take a little longer to complete the posts. Some beads would fall out here and there, but after figuring out a way which required two persons, the beading of the posts sped up, and in between counting beads, sharing of stories came about. This is one of the aspects we appreciate most throughout the creation of this project,” they said. “It was empowering and inspiring to see our individual ideas for the project to merge, evolve, and blend together in collaboration. The collective also created a zine with images, poetry, statistics, and other information to accompany the action, which can be downloaded here for free.